At a time when the literary revolutions of modernism were already being disrupted by postmodernism, it seems strange to encounter such a narrow definition of poetry. New Zealand literature has become more diverse in the decades since (while retaining a strong core of conservatism: Turner has gone on to win a string of prestigious prizes, including the Poet Laureateship in 2003), yet Paul still occupies a marginal position. The issue is not that her work lacks “poetry,” but rather that until recently there has been a lack of easy access to her work. During her lifetime she published outside of the university publishing houses, releasing chapbooks or limited print-runs from small presses. In 2006, however, her poetry was introduced to a wider audience when Victoria published a selected works, Like Love Poems edited by her close friend and fellow poet Bernadette Hall. This untitled piece, originally published as part of a 1973 chapbook, is an elegant introduction to Paul’s poetics. The visual nature of the poem is obvious, the short unpunctuated lines moving out towards the centre of the page, opening up a cavity — a cave — behind it. This visual element is paired with a careful attention to sound: the plosive “partitioned” and “panes,” evocative of division and restriction, shifting into the aural softness of “hollowed.” This combination of shape, meaning, and sound produces an almost tactile effect, bringing to mind Robert Creeley’s theories of organic form: a free verse in which freedom is tightly linked to the shifting energies connecting poet and subject. from Imogen (Days Bay: Hawk Press, 1978), n.p. Stéphane Mallarmé is also a direct influence: Hall mentions, in her introduction to Like Love Poems, Paul’s love of his highly visual work with its close attention to typography and empty space. The centre pages of Imogen are occupied by a sprawling homage to the Italian painter of still lifes, Giorgio Morandi. This piece is similar in form to “i cannot write a sonnet”: here again is the sense of shape and space, yet here the visual features push it into the realm of concrete poetry. As phrases — some addressed directly to Morandi, others evoking his spare, space-filled paintings — are repeated down the page, the elision of words creates an oval around the poem’s central hollow space. The shape suggests the kind of vase that features in so many of Morandi’s paintings; an oval container, a shaped space. Yet this container never fully closes. The capitalized line at the bottom of the page breaks the containment, spilling over the right margin into the next page. The colourful images of those final five lines frequent much of Paul’s work, yet her writing is never purely imagistic. As the early US imagists discovered, the visual intensity of the poetic image is frequently twinned with a tendency towards ossification; devoid of movement, the isolated image has nowhere to go, no direction to grow in, trapped in “still life.” Paul’s work avoids such stagnation by combining the image with other less static energies. In “Lake Wiritoa 2,” the energy is oral. While the second half of the poem presents painterly, almost abstracted images of the human body, water, and landscape, the first few lines ground these elements in the flux of everyday life: exclamations, an expletive, the soundtrack to a summer swim with friends and family in a small New Zealand lake. In the space of four lines, a living — a name meant to represent the presence of a friend — is transformed into an emblem of absence. from Unwrapping the Body (Dunedin: Bothwell, 1970), n.p. Such visual depictions of absence and loss also permeate Unwrapping the Body, a 1979 book that accompanied an earlier art installation. Like Imogen, the book deals with the death of Paul’s daughter. Each piece in the book pairs a photograph with a page of text. The heavy printed text — some of it handwritten, some typeset — recalls the labelling of “Proper Names.” Yet here language is more explicitly concrete. This is especially so in “HEAD caput CUP,” in which most of the text is displayed sideways, stretching vertically down the page in a way that mimics the cord on which the colander is suspended. At first, it is tempting to view them as predominantly design elements: the different styles in which they are written adds to this, as does the minding of common words with medical vocabulary and words written in Greek characters (these Greek words are variations on the English words). These features distract from dictionary meaning. John McNulty, in an otherwise laudatory review of Like Love Poems, criticised this aspect of Paul’s “more experimental work,” describing such pieces as “typographic free-for-alls that push … words as far as possible towards being a purely visual medium.” Such pieces, he concludes, are “poor substitutes” for her paintings. The words in Unwrapping the Body, however, do have clear meaning. Imogen died, before her first birthday, of complications caused by a heart defect. Many of the words in Unwrapping the Body refer explicitly to the circulatory system (“VASA VASORUM” are networks of small blood vessels). 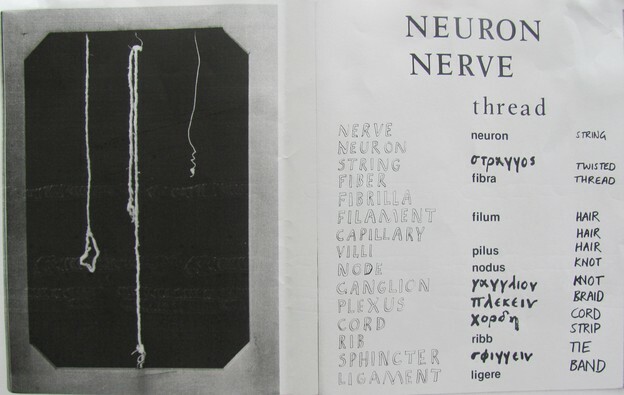 Others evoke the medicalised or dissected body (“RIB,” “NEURON,” “GANGLION”), or to physical and/or emotional linkages and connections (“STRING,” “THREAD,” “BRAID”). Most starkly, there are words that read as direct references to the life of her small daughter (“LITTLE DISH”) and that daughter’s death: “CHEST,” “BOX CHEST,” “SACRIFICIAL BOWL.” There is, in these words and images, both extreme pain and extreme control; a poetry that far from rendering words, as McNulty puts it, “a purely visual medium,” imbues both image and text with deep layers of significance. Of all her themes, this idea of the centre is the most revealing. Ironically, Paul’s is ultimately a poetics of convergence, yet her oeuvre is, from a reader’s perspective, scattered and largely inaccessible. Hall has described how, at the time of her death, Paul’s cupboards “were filled up to the roof with papers … ” There were poems on the backs of envelopes, down the margins of letters, the wedding guest-list beside the phone was itself a poem, in Joanna’s distinctive calligraphy.” The selected poems reproduces only a small part of this prolific output. As she explains in her introduction, Hall based her editing of Like Love Poems on a manuscript previously submitted by Paul to Victoria University Press. She did exclude some poems, including those where visual elements seemed to overtake textual. Like Love Poems, then, does not include the double-page Morandi piece from Imogen, and the achingly emotive pages from Unwrapping the Body lie outside its purview. Joanna Margaret Paul's poetry, paintings, drawings, and films can be viewed online at the NZEPC, Art New Zealand, and Circuit. 1. Quoted by Hamish Dewe, “Parting Closure: Imogen and Unwrapping the Body,” New Zealand Electronic Poetry Centre, last modified August 25, 2005. 2. Andrew McNulty, “Lines of Beauty,” New Zealand Listener, June 24, 2006. 3. Jo-Marie Brown, “Rotorua Hot Pools Charged Over Artist's Death,” New Zealand Herald, December 1, 2003. 4. Catalogue essay to Wanganui Works: Resisting Foreclosure, Wanganui: Sarjeant Gallery, 1989, n.p. 5. Joanna Margaret Paul, Like Love Poems: Selected Poems, ed. Bernadette Hall (Wellington: Victoria UP, 2006), 34. 6. Introduction to Like Love Poems: Selected Poems, 11. 7. Like Love Poems, 68. 11. Like Love Poems, 96. 12. Introduction to Like Love Poems, 9. 13. Like Love Poems, 92.